Fantastic Photo ! Great shot. I have take this photo at the last day of my first travel to Australia, at Melbourne´s Southern Cross Station. It was at the end of the day near 10 PM and it was the last photo from that day. I have tried many times this kind of shot but i dind´t get the results that i wanted, i wasnt allowed to use my tripod inside the station. I wanted to get the trail light effect from the motion of the train, and i did get it for a few moments despite the low light condition inside the station. I have used my Canon 5D Mk III with an EF 24-105mm f/4L IS USM lens, no other equipment was involved. When i go to a city at night i´m always fascinated to get light trails to have more dynamism on the photo. 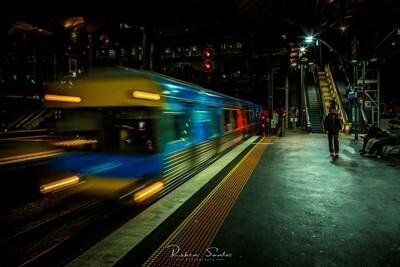 In this particular shot, many elements where getting my attention, the colours, the motion of the trains, the contrast between the shadows and highlights inside the station was so appealing that i tried many attempts to get an long exposure photo. In this shot i have used Lightroom to add some colour vibrance, adjusted the shadows and highlights, and used lens correction to have straight lines, no other editing was envolved. For this day i bring only my Canon 5D MK III with an EF 24-105mm F4 and an EF 16-35mm F4 lens and a Manfrotto BeFree tripod. Normally i bring more gear such as my Sigma 150-600mm Contemporary and some Lee Filters. The Southern Cross Station is one of my favourites train stations in Melbourne, the iron beams and concrete floor gives this place an industrial looking. There is many angles and compositions to be explored inside and out the train station, and in this particular case i was focused on the movement of the trains entering and exiting the platforms. I wasn´t allowed to use my tripod so i tried many techniques to get the image, in this situation the more efficient way to avoid camera shaking was to lean the camera to one of the iron beam of the station and take multiple shots. Never give up and trying different thinks were the key to get this shot, and i was very happy to get it.